The Plex Pass normally costs $4.95/month and has a lot of added features including offline caching for your chosen media, parental controls and managed accounts for the little ones in your house, cloud storage compatibility in case your server is offline, the new Live TV offerings, better music and photo recognition and organization, and more. 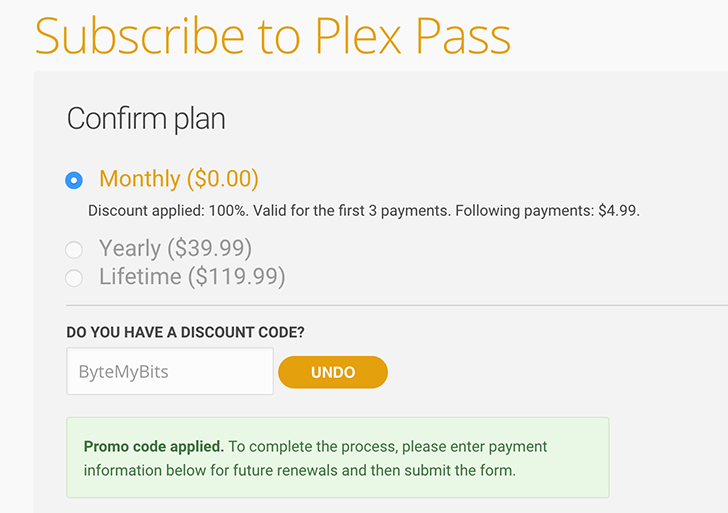 But if you're not sure it's worth the money, you can follow this link or manually use discount code ByteMyBits, and you will get 3 months free of Plex Pass so you have all that time to check it out and make up your mind. However, beware that you will still need to have a Plex account plus enter your credit card and billing details, and the paid subscription will renew automatically after the 3 months are over. The good thing though is you can cancel the renewal at any point, even just after enabling it, without losing your 3 months.